Some leaders believe you must have all the answers; a wise leader knows when to ask the right question. This is a book about questions. Specifically, questions that Jesus asked. Any perceptive reader of the Gospels will observe that Jesus asked a lot of questions. Some of them were quite direct. Others were asked to re-direct. Most all of them seem to have had purpose. In other words, Jesus’ questions were not just things of small talk or polite conversation, they were questions asked and used with intention. As we study Jesus’ questions, we find that they were often leadership questions. Jesus used questions to guide, develop, move and lead others. We find him doing this consistently with his disciples, as five of the six questions we explore in this book indicate. But we also find him engaging others, including those outside his circle of followers – both those who are curious and those who are opposed - with questions as well. In addition to being leadership questions, Jesus’ questions were often asked with the intent to promote spiritual growth and faith formation. In the chapters and pages that follow, we are going to explore six of the questions Jesus asked. The narrative of each chapter will provide readers with information on background and context, as well as some insight into the “why” and “what” of that particular question and its use. At the close of each chapter you will find questions to use with a study or leadership group in a church or ministry setting that will further engage them in thinking about that chapter’s particular question, and their own follow up questions about faith formation and leadership today. Our dual focus may raise a question for you at the onset of the book: “Is this a book about discipleship or leadership?” The answer is “yes”. We believe Jesus consistently addresses both of these topics and endeavors through the questions he asks. He invites both spiritual growth and leadership development in his disciples and others, including us, through his consistent use of questions. Within congregations and ministry settings today there is a deep need for skilled leaders who are also persons of deep faith, and who see their faith formation as an ongoing process. Our hope is that this resource will encourage a deepening and development of both disciples and leaders. Before we move forward with the six questions, allow us to set the stage with a few more thoughts on why Jesus used questions, and how this same approach can be vital to our faith and leadership yet today. When you look at the word “question” it’s easy to locate its root – the word “quest”. What is a quest? To be on a quest is to be about discovery. A quest is literally a journey of discovery. That pioneer or adventuresome spirit that resides within many of us is the fuel for a quest. Whether it is a quest to discover a new hobby, the cure for a disease, or information related to planning a successful family vacation, quests engage us and change us. The same might be said of a good question. Like a quest, a question helps us discover. It unlocks imagination and releases us from the paralysis or stagnation of not knowing what to do next. Questions like a quest move us to discover something we’ve not known or experienced. We would submit that there was the intent of discovery behind these questions. But the questions were not for God’s discovery so much as Adam and Eve’s. In other words, these questions were asked more for the purpose of formation than information? God knew where they were and why they were aware of their nakedness. He asked the questions to help them grapple with their situation. The obvious answer would be: “I’m hiding in a cave.” But the question has a depth and weight to it that invites reflection beyond the obvious. What more may be implied in that question? Perhaps: (“In light of all that you’ve just witnessed and been part of) what are you doing here?” In God’s question of Elijah we see how a leader is being further shaped and challenged. Good questions, like their root word “quest”, always invite discovery. As our study will show, questions come in many types, and might lead to unexpected discovery. For example, consider the story of young Billy. He comes to his mother one day with the question, “Where did I come from?” His mother is somewhat taken aback, but knew this day would come and concludes its time to tell her son the truth about the “birds and the bees” – the facts of life. Billy listens intently and then responds, “That’s very interesting mom, but what I want to know is where did I come from - like, Tommy came from Buffalo and Ronny came from New Jersey.” Mom would’ve been wise to first ask a question of clarification. Staying with the theme of childhood, the first questions we encounter from Jesus occur in Luke 2. Jesus has accompanied his parents on a pilgrimage to Jerusalem for the Passover Feast. He is twelve years old. A day into their return trip home, Mary and Joseph realize Jesus is not to be found among their travel party. Many parents have had this experience of leaving a child behind somewhere, but few of us for this duration. It says in Luke 2:46 it took a total of three days for them to locate Jesus. When they did, they found him in the Temple courts. What was he doing? He was asking questions (v 46) of course. We could read Jesus’ questions with different tones, from surprise to disappointment. But in this case it would appear he is not shaming his parents, but rather reminding them of a truth regarding his identity that justified his actions. Jesus was in the Temple asking questions, embarking on a personal quest to discern his Father’s will. When found, Jesus used questions to help his parents discover (again) his purpose and identity as God’s son. The questions we find the adult Jesus asking persons, including his disciples, are consistent with a rabbinical means of teaching. Instead of lecturing, rabbis often ask questions. These questions are used to engage the disciple in the learning process and begin a dialog between teacher and students. A rabbi might begin the discourse with a question, expecting a response in the form of another question. The student’s question reveals something of their understanding allowing the rabbi to then form yet another question to propel them into the Scriptures or teachings of faith. This model is consistent with an approach to Scripture through the practice of midrash. Midrash comes to Scripture with patience, humility and respect – asking questions of the text in a formative manner. The posture of openness and curiosity allows for many possibilities and levels of faith-filled meaning. Through questions, the text (rabbi) can begin to read the life of the disciple and bring formation accordingly. A good example of this at play with Jesus is found in Matthew 12:10-11. A man came to Jesus with a withered hand. Jesus is asked (an opponent beginning a discourse with a rabbi) “Is it lawful to heal on the Sabbath?” He responds, “If any of you has a sheep and it falls into a pit on the Sabbath, will you not take hold of it and lift it out?” We can imagine a thoughtful pause from Jesus after this question before he goes on to say, “How much more valuable is a man than a sheep!” Question asked. Point made. It may be that you can remember a teacher or two who employed a similar technique with questions in his or her instruction. They may have even turned a student’s question back around to the class, saying, “What do you think?” This use of question is not for the teacher’s lack of knowledge, but rather his or her desire that the students own the answer and information for themselves. Isn’t this what we want for those we nurture and lead in the faith? We contend you can apply the use of questions to leadership as well. Those who lead in congregations today know that churches are in the midst of a tremendous season of change. We are facing challenges of discontinuous change. In other words, we often have no prior experience or predictable patterns to draw from when facing the challenges of ministry in today’s contexts. The prototype “leader as expert” with all the answers no longer fits. Today’s ministry challenges – from the field of stewardship to worship to faith formation – require adaptation in leadership. Adaptive and collaborative leaders will realize the importance of asking questions, both of themselves and those they lead in these circumstances. Doing so will help unleash the creativity of the group and new approaches will surface to the ever new challenges. Learning how to ask the most helpful questions will also be important in this adaptive work of leading. One discipline that speaks to this and relies on questions is the field of leadership coaching. Coaching is simply a process of guiding a person or group from where they are toward where they want to be. It is the belief that the potential, the creativity, and the answers, reside within the persons being coached. It’s the belief that through the employment of good, powerful questions – such as the type Jesus asked – that potential, creativity, and those answers could be harnessed to unlock a leader and/or group from what was previously considered a stuck situation into healthy, helpful forward movement. “Leading” questions guide a person to a desired response. A questions such as, “You don’t want to do that, do you?” does not invite the thoughtful reflection, but suggests a predetermined answer. One can ask a lot of questions that do little more than rehearse already known information. Or, one can be intentional in asking a few questions that cause persons to listen, reflect, respond and grow as disciples and leaders. Leadership or life coaching is a discipline built around good questions intended to produce forward movement in the lives of those who are being coached. (Additional examples of these different types of questions, including some sample coaching questions, can be found in the Appendix). Whether it’s through formal or informal coaching, or other approaches to ministry, pastors and church leaders engage in leadership activities all of the time. Often this happens through the daily and weekly obligations of ministry. Pastors lead through preaching, in pastoral care, by teaching a Bible study or facilitating a small group. Church leaders lead through team meetings, in working with volunteers as they plan church activities and carry out mission projects. Leadership isn’t an activity we only engage in separate from our other work. Leadership is part of all of our work. We see this in the life of Jesus. He was always leading people, often through the use of questions, as he encountered and interacted with them. 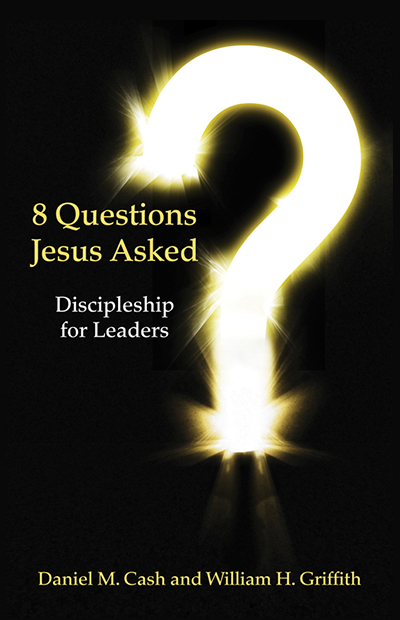 In the chapters that follow, we will explore six of the questions Jesus used. This will give us greater insight into how Jesus taught and led others. As you reflect on the questions, and how Jesus posed or responded to them, we hope it will prompt you to consider afresh your own engagement with others in life and ministry. We hope it will cause you to form some questions and use them in your ministry as you lead. We hope you will reexamine your own faith and response to Jesus’ questions. We hope you will be encouraged. We hope that you will be challenged. We hope that you will continue to develop and grow as both a disciple and a leader. 1. Take a moment to remember some of Jesus’ more familiar questions in the Gospels. What question did Jesus ask that is most memorable for you? Why? 2. Where in your own personal journey (education, vocation, avocation) have you been exposed or invited into a growth experience that was centered around questions? What was the outcome of that experience? 3. Consider your current church or ministry context. What one area of ministry would most benefit today from the use of a few open and powerful questions? What are one or two questions you might pose to others about that ministry? 4. If you were to form an open, powerful question for yourself – given your current chapter or situation of life – what would that question be? How do you respond to it? i. This understanding of Midrash is adapted from Richard Rohr, Hierarchy of Truths: Jesus’ Use of Scripture, (Albuquerque, NM: Center for Action and Contemplation, 2014), CD, MP3 download. ii. Gary Collins defines coaching as “the art and practice of guiding a person or group from where they are toward the greater competence and fulfillment that they desire.” Gary R. Collins, Christian Coaching: Helping Others Turn Potential Into Reality (Colorado Springs: NavPress, 2001), 16.